0.3 liter of flour. I use rye and wheat but take what you prefer! Corn flour works well. 0.5 liter of seeds and nuts and dried fruit. I use whaterevr I have home, sunflower seeds, pumpkin seeds sesame, linseed, almonds, goji berries, apricots. I use more seeds than nuts, becasue the texture is smaller, and it keeps better together. Put baking paper on a 40 x 40 cm (or something around this size, doesn´t matter to much)tray and then spread the dough out with a dough scraper. It should be pretty thin. Put the tray in the owen for 25 minutes in 150 degrees. Take out after that t cut in a size you want and thereafter put it in again for 35-45 minutes depending on how crispy you want it. My favourite right now is with gojjiberries, and some cinnamon on top! Next PostSka ni inte komma till Lyngen? sounds delicious! thanks for sharing your fabulous recipes. Tried your recipe yesterday. Absolutely delicious. So quick and easy to make. Going to ditch the ‘snack ‘ bars full of sugar for these. Yuum. Thank you. Why sugar? It´s better taste without! No need to have sugar! Dried fruiet is sweet enough. Hi Emelie, Saw your video on youtube baking this crispbread. Showed the video to my family and served the crispbread: everybody loves it. I make it for our road trips, hiking, golfing, … delicious 😉 Thank you for sharing this with us. I spread it pretty thin and left it in the oven for 15 min longer…. Would you still eat it anyway if it was chewy? Tara, that+s a pity! Sometimes it needs longer time int the owen, wish you luck!! 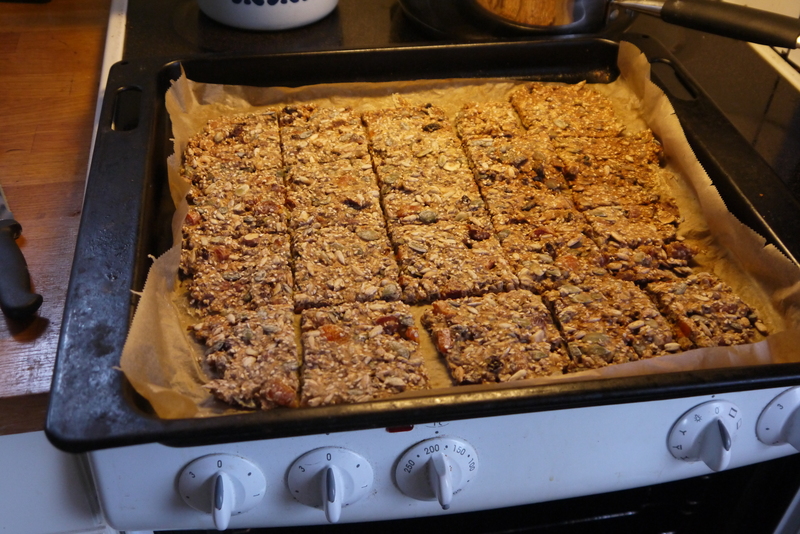 I used to buy cereal bars to eat as a snack in work or when hiking. Now, every sunday, I bake your crispbread and it keeps me going for a week. Baking crispbread bacame one of my sunday rituals :). Thanks for the recipe and happy running!! First crispbreads done, slightly burned (my fault) but delicious. Next batch will be perfect. Great and tasty fuel for the long exercise. Thanks for sharing these recipes. Keep up the fantastic piece of work, I read few content on this internet site and I believe that your blog is rattling interesting and holds bands of fantastic information. Hi Emelie! 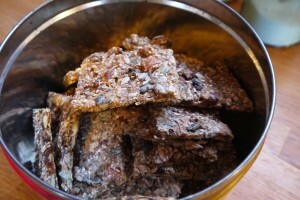 I tried this crispbread recipe and it is great! No sugar, no butter and super tasty : it’s perfect!